With heavy rain and thunder storms forecast all weekend, Tony and I questioned whether or not to fish this weekend, but our passion for the sport we love was far too strong to let a little bad weather stand in our way. I picked Tony up at around 4pm on the Friday and with the car loaded we set off for our chosen venue. 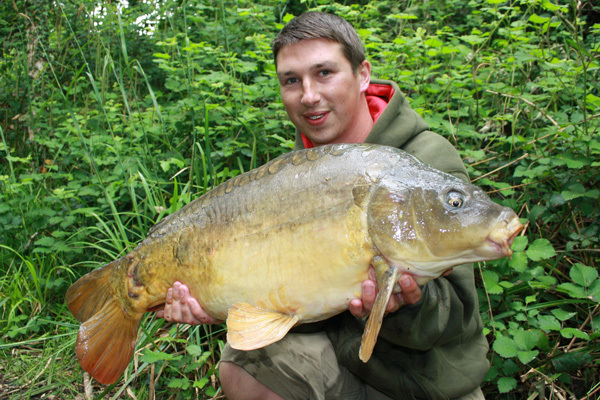 A complex of three lakes, the first one being the smallest of the three and not fished, the second and middle sized had some good Carp in but was wall to wall with weed, and the top pond, the largest one and reputedly the one with the biggest Carp. This was the one we planned to fish; it’s weedy at the shallower top end and deeper plus clearer at the dam causeway end. We parked in the lay-by, made our way through the woods, across the field and onto the lake. The terrain was tough going and with one barrow between us we knew it would be a complete mission when we went back for the gear. Once at the lake we were still in two minds if it might be too much effort transporting the gear to the swims, but still we strolled around in the hope of finding some fish. The shallow end was receiving a strong breeze, it looked good and our prayers were answered when we spotted a good fish roll close to the margin. We watched on as more fish showed themselves and once we’d decided to pitch up for the weekend in the two swims on that bank we continued our stroll around the lake. 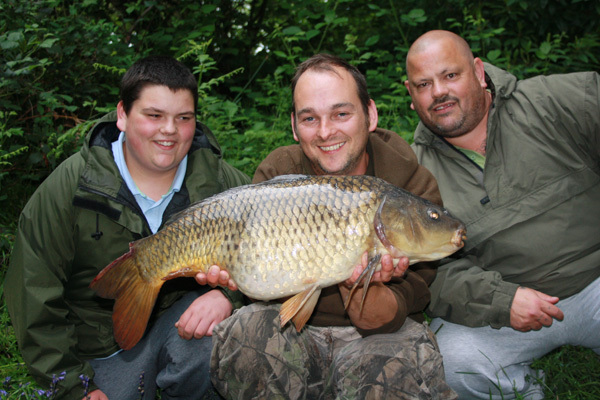 However, as we got to the deep and we spotted three lads pushing a heavily laden barrow with enough Carp gear for three lads, they stopped in our swim choices and prepared to make their camps. Tony and I looked at each other, scratched our heads and cursed our misfortune. It was then that I suggested Carron Row, a venue very close by and one I’d spent a lot of time on in the past, Tony, on the other hand, had only spent three previous nights at the complex and each one ended fruitless so he wasn’t overly optimistic, but, we could think of nowhere else to try that late in the afternoon, the decision was made to fish pond 3, that was if there were any swims available. We drove up to the causeway between ponds 2 and 3 and were delighted to see pond three devoid of anglers, we quickly secured our swims with buckets and proceeded to unload the car. Tony opted for the swim opposite the sunken tree and I set up in the Pipe Swim. 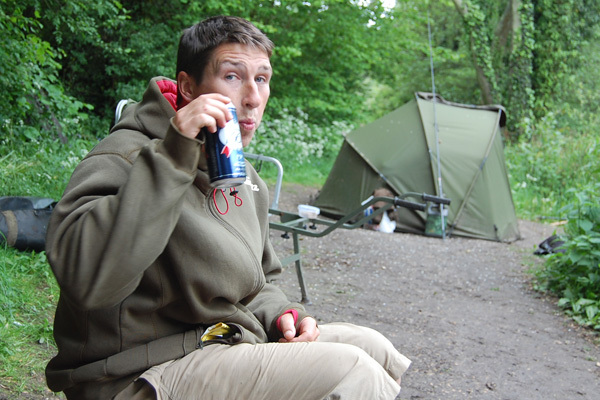 With the rods in we sat back with a cuppa and before long the first of the raindrops fell. Just then my right hand rod, fished close to a tree on the nearside right hand margin let out a few bleeps, I watched as the bobbin slowly crept to the top and as I struck I felt that typical Tench like resistance, something I’ve grown quite familiar with over the past few weeks. We unhooked the fish in the margin and I cast the rod back to the spot followed by a few free offerings. We sat outside the bivvies for a while chatting but the rain got steadily harder and harder along with hearing deafening claps of thunder drawing ever closer. At 10pm we retired to our bivvies and listened to the awesome conditions so close but unable to get to us. Woke at around 6am and Tony was already up and watching the water. It was still raining when I woke but as the kettle boiled the rain stopped, but the rods hadn’t moved. Bacon rolls were washed down with more tea, Redmire tea. This was a new method of tea making I picked up at the last work party there. All that is involved is to add the tea bags (and you can be as liberal as you wish) to the kettle prior to boiling, this means the tea brews during warming and makes for a truly beautiful cuppa, but be sure to boil the kettle slowly. Just before midday we were starting to wonder if the Carp would make an appearance. We still had all afternoon and another night before us so we weren’t panicking too much. Tony reeled in his rods and set up his staking gear, tiptoed round to the island pads swim and freelined some luncheon meat close to the pads. Whilst he was at it I thought it was a good idea so wound my own rods in and walked along to the opposite end of the pond, the shallows. I fired a few mixers out behind the sunken tree and sat back for a while to see if anything materialised. Within a couple of minutes I noticed a big pair of white lips break surface and half a dozen mixers swiftly disappeared. Now this is where I should have been a true friend and called Tony over to fish for these feeding Carp, after all, he was still to catch a Carp from this venue and surface PB was 12lb. Instead, I selfishly set up the 10ft stalker, attached two mixers to the shank of a size 6 Korda Kaptor and trotted back with my rod, net and a pocketful of mixers. I crouched down in the narrow, jungle type swim and threw out some more freebies only this time one by one to cause fewer disturbances and I watched as they were all eaten. I flicked out the hookbait letting it gently plop on the surface and almost instantly I was attached to a hard fighting carp. 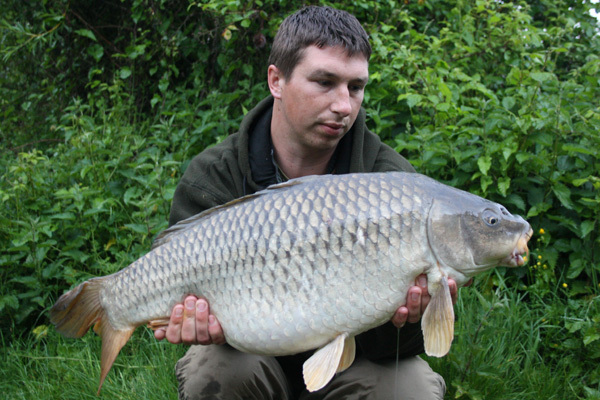 It was a fine looking Common I estimated to be upper double, I called out to Tony who congratulated me, helped me weigh it and took some superb photos. 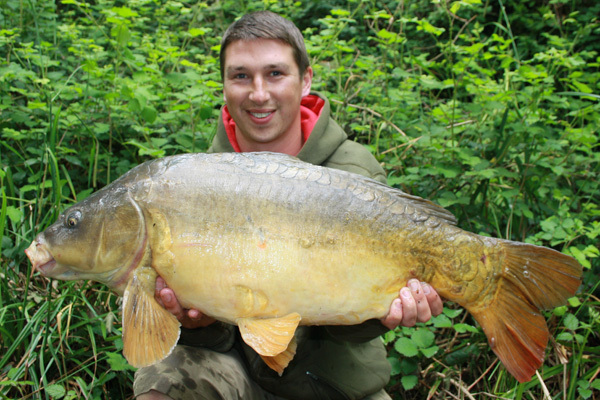 This was just what we needed to get the confidence flowing, and at 18lb it was a good start, but I still felt I’d cheated a friend, with this in mind I decided I’d not fish any more until he’d caught one. 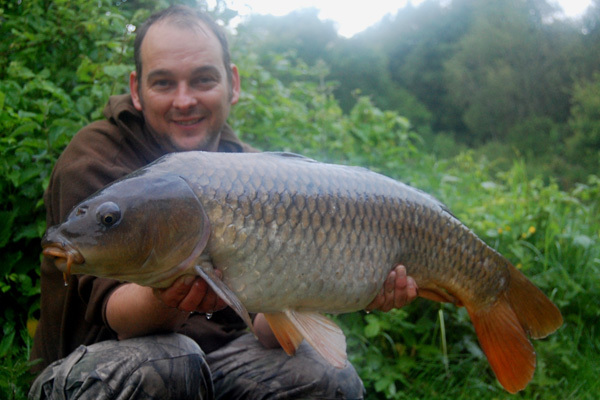 With my spot disturbed I joined him in the Pads swim, re-baited the floater rod and handed it to him. He cast out among the pads, saw a fish rise and as the Carp sucked in the mixers he pulled them straight back out again, a very close call. Next cast and another fish rose, only this time he connected, although quite soon after the hook pulled, it started to look like he was destined to have bad luck at Carron Row. Just then we noticed some tail patterns in a gap between the pads, I returned to our swims, fetched a bottom bait rod and when I got back Tony cast to the spot and sat back to wait, although he didn’t have to wait very long at all, a couple of minutes passed and the rod tip pulled round. 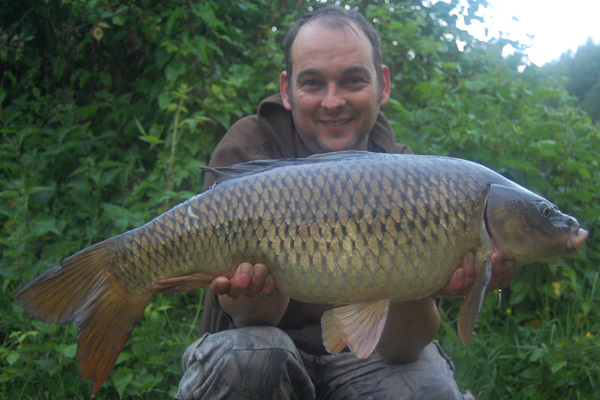 Carp on; it put up a tremendous struggle among the pads but I soon netted his very first Carp from the venue. It was a small but very pretty common of around 8lb, I took some pictures and shook his hand, the boy was off the mark and we’d had one apiece, deep down I new he’d come good. The next take we had I hit but the hook pulled quite early on in the fight. Then Tony struck the next bite and a very angry Carp tore off through the pads but, yet again, the hook pulled. I’ve experienced fishing this spot for a few seasons now and it goes with the territory to lose a few, but if you say you land every other one then you’d be close. Whilst he watched the rod for another take I popped back to the jungle floater spot and flicked out a few mixers in the hope of tempting something. 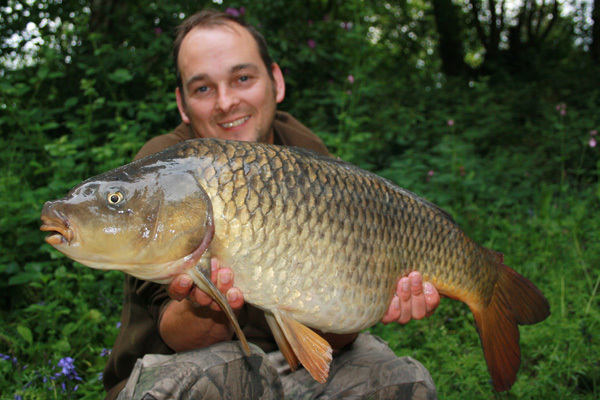 Within around 15 minutes I had two fish feeding fairly confidently so I phoned Tony and told him to reel in and bring the net and floater rod. I pointed out where the fish were feeding and his first cast landed perfectly. I could see the look on his face as the Carp swirled closer and closer to his hookbait; I swear I could almost hear his heartbeat from 10 yards away! One by one the free offerings disappeared until up came those big old lips and the hookbait was gone, there was a pause, it seemed like an eternity but like a lightening bolt all hell broke loose. He struck and the rod took on its full test curve and the powerful Carp tried to gain the sanctuary of the snag tree, I must say he played that fish impeccably, sinking the rod tip deep under the surface and not giving an inch of line. The great fish flapped around on the surface some way under the tree for all it was worth and we could see a huge yellow, orange tail waving at us, but still Tony held fast. 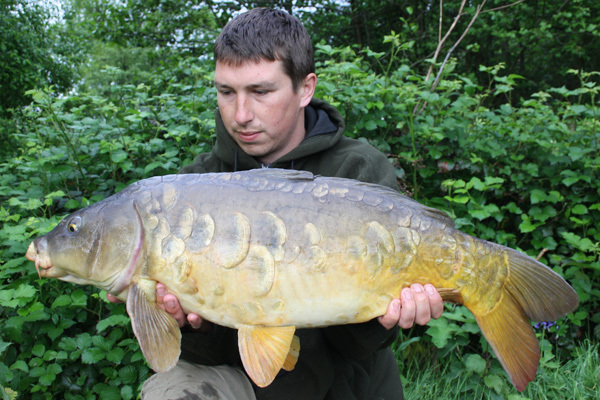 Away from the snags and out of danger I readied the net and slipped it under a corking mirror Carp. Once safe we both cheered, did a little dance and calmed ourselves down rather rapidly in case anyone was watching. What a fish, I didn’t want to temp fate by saying it to him but I thought it looked very close to, if not, twenty pounds, either way, it was much bigger than his previous surface caught PB of 12lb. The fish was gorgeous, we both gazed down at its beautifully decorated flanks and, to be honest, I couldn’t tell who was most pleased, Tony or me! 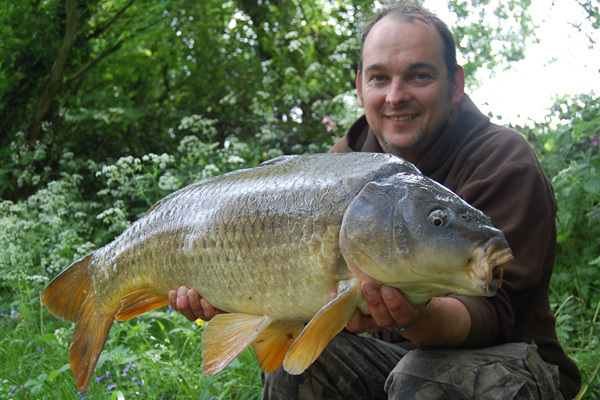 We weighed her at 20lb 2oz, did the photos and said farewell to a very special Carp. It was an epic battle between man and beast, I just wish I'd videoed it! Back in the Island Pad swim we celebrated his great achievement and twenty minutes later I caught a scrappy 6lb common from the gap in the pads. 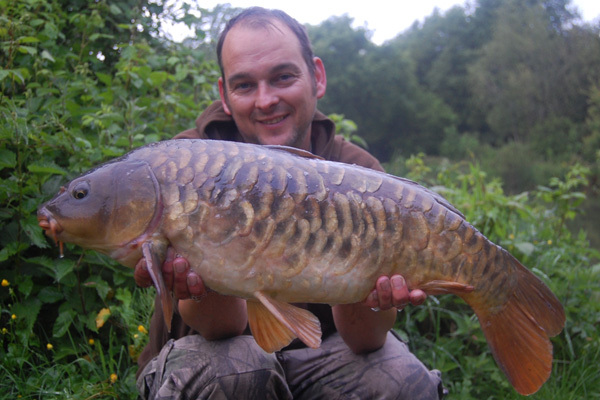 Tony was up next and lost a decent fish after a turbocharged run!! Time was getting on by now, it flew by and the whole afternoon felt like just an hour. So, we decided to get back to our swims and get the rods out for the night, but not before I stalked another common of 15lb 4oz off the top..
Back in our swims we had all four rods freshened up and fishing before nightfall. We had dinner and spoke of the days great triumphs. We kind of guessed by now that, going by the previous evening, the nights would be quiet but the daytime stalking would be great so the plan was to get up early, reel in and maybe stalk for a couple of hours before having to leave. We finished off our hot Redmire tea and as the heavy rain returned we retired to our bags tired but still smiling from the day’s events. I woke to the sound of my alarm, but it wasn’t the phone one, one of my rods was away!! It was very early but bright enough to be able to see what we were doing. The rain had eased slightly but the ground was still very slippery so I gingerly crept over to the rod as quickly as I could and picked up the rod. The scrap was very short to be honest, quite jagged under the rod tip and I started to wonder if it was a Tench, that was until I heard Tony shout “Fully!”. After that I started to panic and played it that little bit more gently. Tony expertly netted the fish and we weighed the beautiful creature at 16lb 8oz, did a few snaps and released her a few swims along. I had just started to prepare things for tea when Tony burst from his bivvy and made contact with another Carp, at first it snagged him but with steady pressure he soon had it into open water charging up and down the margin and making Tony realise that this was a good fish. He coaxed the fish closer and closer to the awaiting net and it sipped in first time. 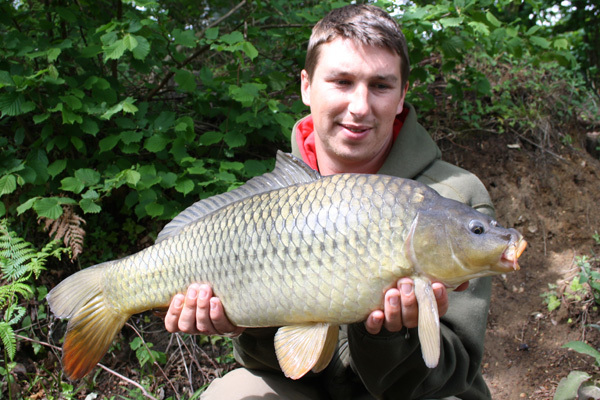 A wonderfully shaped common of bang on 21lb was soon photographed and returned to the water, what a morning! Before we could get the kettle on I was away again, another strong fish that wiped out my other rod completely but was soon in Tony’s net and on the bank being weighed (19lb 6oz) and photographed. A very long and lean common with bags of power, shaped like a torpedo. This session was just getting better and better every minute! A crazy morning but we soon had a nice, hard earned cuppa in our hands. Just as I’d finished my drink and was thinking about breakfast I received another take from in front of the pads opposite, a strange take in as much as it lifted the bobbin and hit the line clip only to drop back to the floor and go incredibly slack. I picked up the rod and wound at least half way until I made contact with the fish Yes, another common for me, slightly smaller at 13lb 7oz but still a pretty fish and worthy of a few pictures. After that the rods went quiet, I was quite happy to sit back, wait for the suns warmth to dry out all the kit ready for the off and to sit down to some nice bacon rolls. Tony had other plans, as quick as a flash he was reeling in and running back round to the Island Pads swim, only this time he had his Barbel rod and reel with 8lb line! I stopped him, explained that those fish were powerful and the pads were thicker than we thought, but he was adamant that he wanted to christen the Barbel rod with a carp, with a cheeky wink as if to say “You watch me! !” off he trotted so I followed to see how he’d fare. In the swim Tony flicked out a piece of luncheon meat in the area we had the takes from the previous day, laid the rod on the floor and hovered over it ready to pounce. A few minutes went by and the rod tip nodded, he struck and felt a powerful resistance on the end, clearly a carp, unfortunately the hook and line parted company. I tied on a new hook and Tony had another cast, the next twitch was hit and a Tench was weaved through the pads, unhooked and released just along from the swim. My turn next and a few tweaks made me suspect that Tench were the culprits once again, I struck and my first thoughts were confirmed. After releasing the fish Tony attached a piece of meat to the hook, flicked it through the gap and waiting the minutes for the next bite. The next bite came but was a whole new ball game, he had quite obviously connected with a decent size fish, it was swirling around in the pads and the poor old Barbel rod took on quite a substantial curve, but Tony kept the pressure on and eventually got the fish moving once again. It swam from pad to pad trying its best to free itself from the hook but with one final effort the fish was steered away from the pads and out into open water, how he managed that I don’t know, it was kind of cool watching it though. The first time it rolled we could see it was another mirror, but the second time we saw it roll we realised just which fish it was. 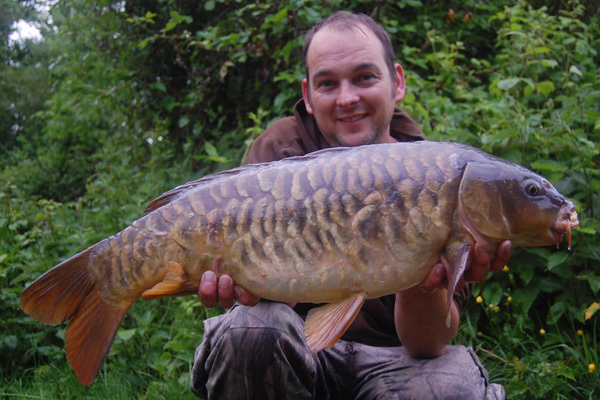 It was the scaly fish with the back scale inners, a fish I had a couple of seasons ago and one that Tony said he’d love to catch. Round and round and up and down the fish charged but as soon as she came up for a gulp I slipped the net straight under her and she was ours……yet another battle of epic proportions! 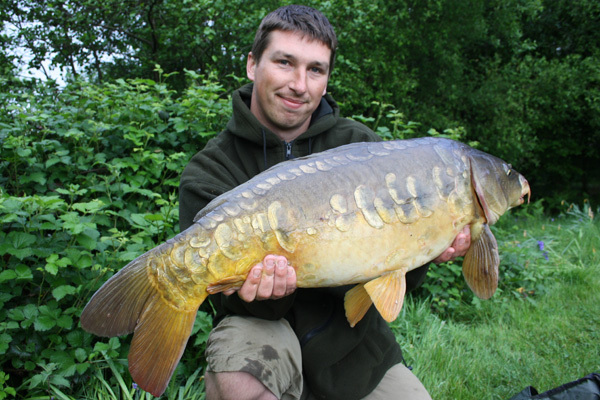 “What a fish” and “Stunner!” were some of the things we were saying to each other, a fair amount of jumping around also took place and hand shakes were given to the man who told me he’d land a Carp from a tricky spot on light gear, and succeeded! Tony was absolutely made up, as you can well imagine, and so was I to see just how happy he was with the session. We weighed the beautiful mirror at 17lb, it hovered just over but Tony didn’t care about the weight, it didn’t matter too much. The pictures were done and the fish returned. Soon after we looked at each other and told each other how tired we looked, it was a crazy weekend with nothing happening until 11am on Saturday and the last fish came at 10am on the Sunday, so really it all happened in under 24 hours, and bearing in mind I fished this pond a lot in the past and never had more than 2 fish out in any one session.